Do ghosts not do digital? The book is on a fascinating topic... which is people who seem to have received phone calls from people who have "passed on". I sheepishly admit to not having read the book thoroughly "back in the day" (I skimmed, I admit it,) but upon a closer inspection at the recommendation of many of my contemporaries, I understand why it was important to give it a more thorough going over. It really does give a history of EVP (electronic voice phenomena) that many of my contemporary enthusiasts (and others) do not know. Basically, as a book, it really should be "required reading" for any reasonable ghost investigator/researcher and doubly-so for anyone suggesting they are seriously studying EVP... Like I said, there were times reading the first few chapters where I wanted to yell, "C'mon now! You're making an awfully big leap here! ", but from Chapter 6 on, where the discussion looks more into "causation" than speculation, that really anyone in this field should read and know about... well, if you're serious about this phenomena. 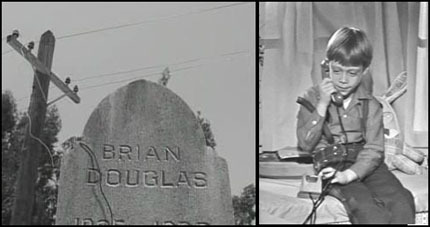 Then there's "Long Distance Call", first shown on March 31, 1961 and written by Charles Beaumont and William Idelson which features a young Billy Mumy receiving phone calls from his deceased grandmother on a toy telephone. The grandmother tries to "claim"(?) the young lad by seemingly sending him off to drown, but when the mother picks up the toy phone and pleads with the grandmother to give him a chance at life, the paramedics are able to revive him. Did these television programs (amongst other stories and the like,) stimulate these experiences? Did they "feed" either some imaginations or even somehow fuel PK phenomena? These possibilities exist... and are delved into... but to be frank, the reports of this phenomena outdate Rod Serling's televised efforts by some years. Regardless, the question I now have, after reading this book, is why don't I hear of this happening as often now? Especially in a world dominated by telephones literally around us 24/7? Being an investigator, the obvious question is "What changed?" What's different between phone lines in the 1930's through the 1970's (the key dates for most of the cases in the book,) and the mid-1990's through current day... when I've been truly nose-to-the-grindstone in reading/looking into cases whenever and wherever I can. Oh, please DON'T send me e-mails telling me how it DOES still happen "all the time", because Torontoghosts (since 1996) and all the groups up to PSICAN literally have thousands of reports... and only three feature a phone call that MIGHT be considered "perhaps paranormal"... or, to be honest, without seemingly decent explanation... well, save one of the three that was voice-mail related, but we can "replicate" the message and how it would have been sent and received... and the case did lend itself to possible "hoaxery", not on the part of the witness, but on a third party trying to "prank" the witness... so three... maybe only two... in thousands. Also, as stated, why no mobile/cell phones? Are they impervious? There is a BIG and GLARING answer... and it is eluded to in the sub-title of this note... "Digital" vs. "Analogue". ...is it possible that "Ghost Don't Do Digital" then? Considering Bayless and Rogo went on at length (rightfully so) about the way a telephone works and how voice recording in general is accomplished... and although certain principles remain the same, Voice/Sound Vibrates Air which in turn Vibrate Film or Element on Microphone, after this, all bets are off! Voice and data communications (the transference of your voice from one telephone to another,) has taken some radical advances over the last thirty years... Could this explain the "drop off" of these calls? ...or they neglected to pay their phone bills. Although the book is out of print, for those wishing to find it, I know it was fairly easy to find via The Toronto Public Library...so try your local if interested... or you can purchase a used copy from Amazon. If we accept this hypothesis at face value, how long will it be before we have text messages from the dead? Tweets from the dead? Facebook status updates from the dead? Part of the immediate notice above is tongue in cheek... but realistically, one has to accept that if phone calls from the dead "just happen", then it's a distinct possibility this could be next. I will now avoid making jokes about the traced origin of IPs "from the dead" who are considered to be "damned" or in the other place that isn't "Heaven"... and what locations those would REALLY trace back to... like... well, best not to gain the ire of certain towns and cities... no matter how much I want to make fun of the North Hastings area of Ontario.